Move out day is almost upon us current students! I cannot believe how fast this year flew by! It feels like just yesterday I was moving everything into my dorm and now I’m moving it all out! In this post, I’ll discuss some ways to make move out day go smoothly and some tips for checking out! The first thing students must do in the move-out checklist is to make an appointment to have an RA check you out of your room for good! These appointments can be any day of this week-finals week-and are in 20-minute time slots (but hardly take that long). Students must have everything out of their room by their checkout time, and must be ready to have an RA check the room. At the end of the appointment, the student will give their RA their key and no longer have access to their room. They are done for the summer! Hi everyone! Happy finals week! The school year is so close to being over that I can almost taste it. This will be my second to last blog post and I wanted to talk about one of my favorite things to talk about, food! Tried out a new restaurant this week located very close to Loyola’s Lakeshore campus and wanted to tell you all about it. Because who does not want to try out new places to eat?? I am always down for a culinary experience in a new restaurant. The restaurant is called m.henry. Located at 5707 N. Clark Street, this place is always packed and always amazing. 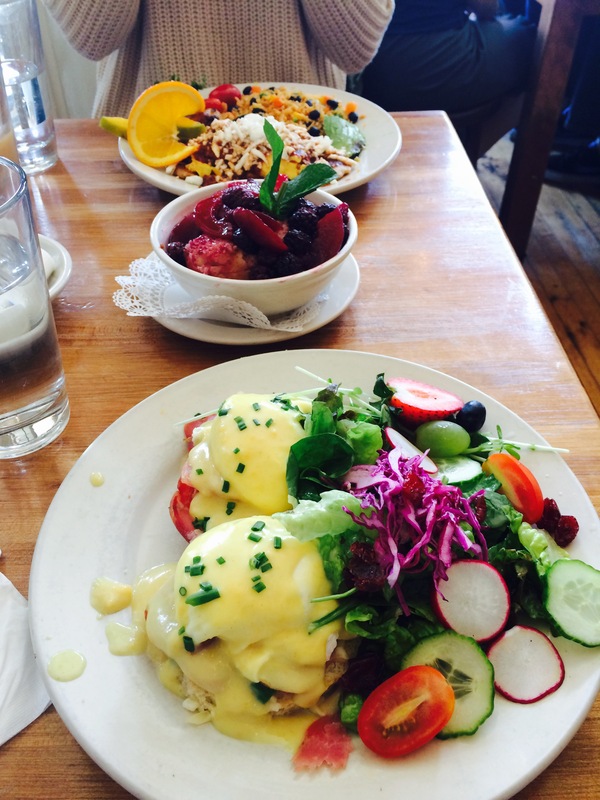 A breakfast/lunch spot perfect for anyone, this restaurant prides themselves on their fresh and delicious food options and fantastic desserts. They try to use as much local produce and organic products as they can in creating their dishes. The atmosphere was very welcoming and homey and there was even a little section to purchase baked goods that they bake in the restaurant. While waiting, my mouth was literally drooling over their mini coconut pies and their lemon cakes. Everything looked so good! I went for breakfast. The place was super crowded and we had to wait for about 20 minutes, but you that a place is good if there is a wait. Once we were seated, I instantly browsed their menu. Not knowing anything about the place, it was hard for me to select a dish because everything looked and sounded out of this world. There is a sweet section of the menu and a savory section. The sweet section had mango and blueberry cinnamon French toast, four berry hotcakes, and other mouthwatering sweetness. The savory side was equally tempting with bacon wrapped eggs, shrimp and crab cake bennies, and a home comfort plate. The dish that caught my eye was the roasted asparagus and prosciutto benedict. IT WAS TO DIE FOR! The dish describes itself, but for the hollandaise, it was a rich and creamy parmesan sauce with a bright mixed green salad on the side. My friend decided on enrique’s morning plate which was a Mexican style dish. It consisted of two homemade tortillas with avocados, eggs, chorizo, tofu, ancho chili sauce, and cheese. It came with rice and plantains. Since we both got savory and wanted something sweet to share, we decided on the out of this world breakfast bread pudding. SOOO GOOD! It was a vanilla and egg custard brioche bread pudding with blackberries and peaches as a topping. It we didn’t get that to share, I could have eaten that all on my own! I would recommend this place to everyone and anyone. It was probably one of the best breakfasts I have ever had and I have been to quite a few breakfast places around Chicago. So go check it out! You really will not be disappointed! When I was looking for schools, I thought about my future, what kind of person I would become, how I could possibly fit in with everyone, and if the prestige and academic standards were too high for me. 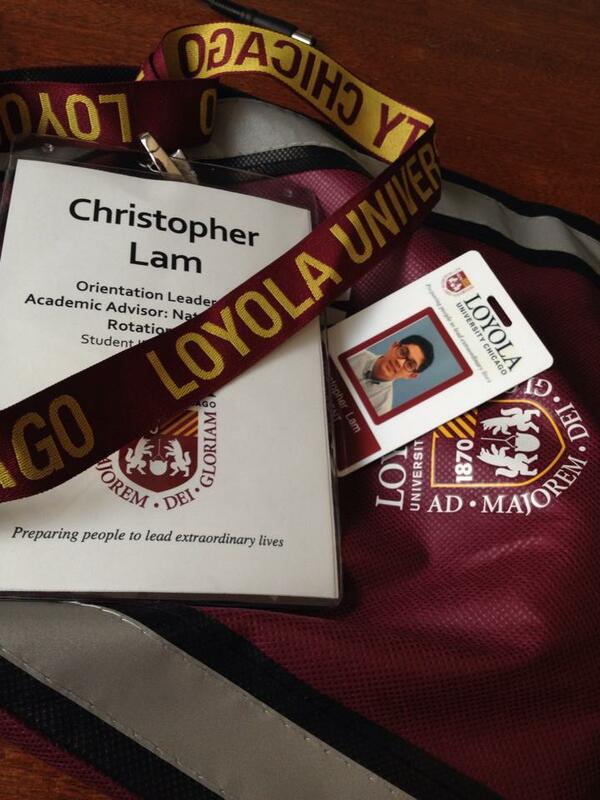 Nonetheless, I went with my guts and chose to attend Loyola. Still to this day, I have no regrets about that decision. From the very beginning, every new student was required to go to an 2-day and 1-overnight stay at Loyola. Even then, I was incredibly nervous. I knew nobody and my social skills weren’t so good. Plus, I have never been in a dorm before nor have I slept elsewhere besides my own room. Anyways, on the first day of orientation, I was put into a small group of 10 other students and to this day, I still know 5 of them very well. We are close friends! That evening, night, and next day flew by so quickly because I had people to talk to which made everything else much more bearable for me. When school started, I had to adjust to extended school hours (some classes ended at 3:46PM and others at 5:30pm for me). With that, I had to learn how to use my free time wisely. Never in my life did I have so much independence. I used my free time for getting school work completed, visiting teachers during their office hours, going to mass, eating outside in the quad, and more. Commuting! Especially for commuters, things can and will get rough and challenging. Weather conditions can get in the way (mostly in the winter) and because you live at home, there are home obligations in addition to the academic obligations. If you would like to know more about this, I have two blog posts on my commuting experiences on my page. From January onward, I hit a personal barrier. A family situation had come up and it affected my academic performance and physical and emotional state. Despite that, I sought out help through my academic advisor, psychologist from the Wellness Center, Dean of Students, and Financial Aid Director. I am happy to say that things are slowly getting better for me and hopefully by the start of fall semester, I will be completely up on my feet and ready to start anew. Throughout the school year, I was a part of the American Medical Student Association, Vietnamese American Student Association, and Off-Campus Commuter Life group. 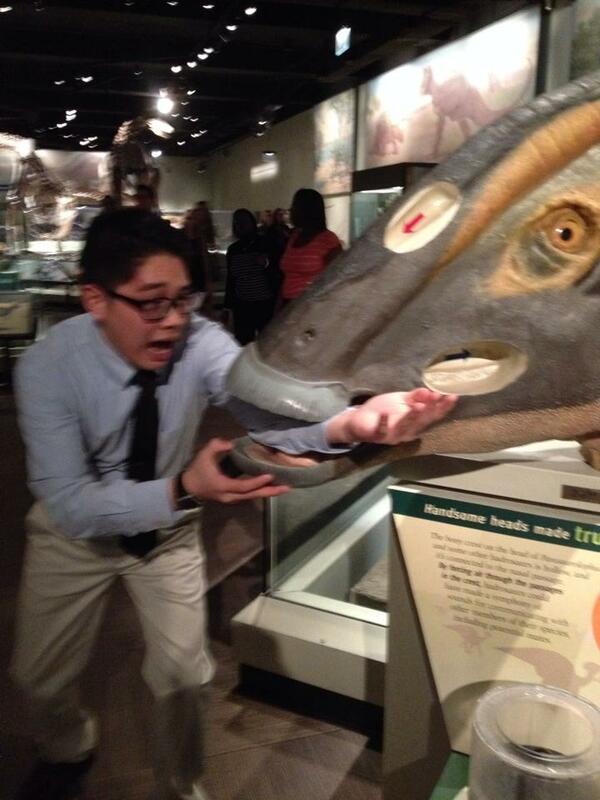 It helped get me active within the Loyola community and along the way, I made more friends! I plan to continue joining all these groups next school year in addition to A.C.E., a group that pertains to students of low-income, first-generation, and more. As I conclude this final blog post of this school year, I want to thank all of you readers for wanting to read my blog posts and go through my Loyola journey. Also, hopefully you had the opportunity to learn more about me, my hobbies and interests, and more. It was a privilege to blog and represent Loyola and I hope I have the wonderful opportunity to resume Rambler’s Pie: A Fresh Slice of Loyola starting next semester. Sometimes I am shocked and surprised to realize that one full school year is almost coming to a close. Time, does indeed, fly by quite quickly. For seniors, this is their moment to shine; the countdown to graduation is nearly here. But until then, everyone including myself must stay focused on doing well on the final exams. 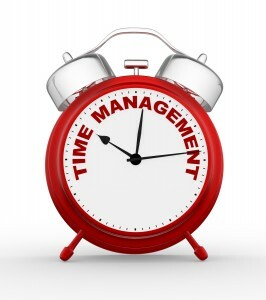 Time management is crucial before and during finals week. Students must learn how to prioritize themselves and balance their time to study and time to have fun. Some subjects require less attention than others, for instance, people might dedicate more of their time and effort for organic chemistry than for leadership class. It just depends. Write yourself an hourly agenda. This helps you keep organized and explicitly shows you what you need to get done at a specific time. Remember to consider some time in-between to relax and take a break. Prioritize. Do not procrastinate, as even I know that is very hard to do. Find out what needs to get completed first. Which finals come first? Zone-out any distractions. Specifically with social media, on-line or on your smartphone, things can get very distracting. Mute your phones if you must; move to a quiet study area! Allow yourself to maintain a focused mind and concentrate on studying. Remember, in the end, all your hard-work will pay off if you truly put the time and effort in. See the teacher. Going to see them personally may help you immensely because they may be able to give you more information on what will be covered on the exam. Packing up your stuff isn’t always the easiest thing. I really hate it, and it’s always the most difficult thing for me. The best way for me to do it was to take my time. Get another person in the room with me and makes sure that it’s just not me in a silent room alone. It’s boring and not fun, and can put a damper on the exciting fact that summer is so close. Pack everything that you won’t use for a long time first. For me this was winter clothes and blankets, things that I haven’t used in a while. Next went going out clothes, crop tops and short shorts because Chicago is still so cold. I’m so confused as to why it’s this cold, but it sure is. Packing is not the greatest thing ever, but it has to be done. For larger items, like TVs or refrigerators, make a plan with your family as to if you’re selling them, bringing them home, or throwing them out. Everyone have a fun time packing and just remember you have to get through this week! At 108 stories tall and grandly poised in the heart of Chicago, the Willis Tower held the title of the world’s tallest building for nearly 25 years after its completion in 1973. The Skydeck Chicago, on the 103rd floor, remains the highest observation deck in the U.S. On Friday, I become one of the 1.5 million travelers who visit the Skydeck each year. The Ledge, comprised of glass boxes that extend about four feet beyond the building, is definitely not for the fainthearted, nor for individuals with the slightest fear of heights. One glance at the 1,353-foot vertical view, straight down through the glass floor can have your heart racing. The creation of The Ledge was inspired by the hundreds of forehead prints tourists left on the windows each week as they tried to catch a glimpse of the city below. The engineers and designers of The Ledge worked hard to create a near-invisible support system by eliminating all steel structural elements of the boxes. Interestingly, the transparent viewing platforms were designed to be retractable, apparently for ease of cleaning and maintenance. On a clear day, visitors can enjoy an unobstructed, breathtaking view of the entire city and can see the states of Indiana, Wisconsin and Michigan. However, for the sake of pictures and lighting, a cloudy day creates surprisingly perfect conditions for photos without any awkward shadows or glares from the glass. Insider’s tip: To avoid the otherwise constant crowd, capitalize on statistical data and go in the afternoon, several hours before sunset, when there are the least number of people. 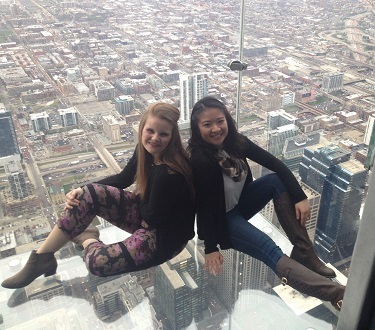 Despite being guffawed by locals as part of the garish tourism scene, visiting the Skydeck is such a unique experience that going once is a must for anyone living in Chicago. As I check “Skydeck” off on my list of signature Chicago sights to see, I am eagerly looking forward to continuing my quest to take advantage of the myriad sights, tastes and adventures this fabulous city has to offer. Well, I suppose the End of Semester Banquet wan’t exactly prom, but close enough. Getting dressed up, posing for pictures, eating a fancy meal, and spending a night out in Roma as one big JFRC community had it feeling just about like my senior prom. 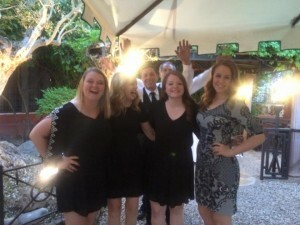 Well, besides the fact that my senior prom wasn’t in Italy. Our “Night Among the Ruins” began with some pictures in the JFRC courtyard before we all hopped onto the coach buses that shuttled us to our dinner destination. We went all the way from the northside of Rome down through the south passed the neighborhood of Testaccio. Our bus ride was accompanied with some good music and a nice little sight-seeing tour of Roma. The restaurant that hosted our banquet had a really nice courtyard area where we had a “cocktail hour” before our meal. One of the full year students opened up the final festivities with a welcome speech about just how incredible and transformative his experience at the John Felice Rome Center has been for him. Even though I had only a semester, rather than a full year, to enjoy the JFRC I definitely agree with him that this has been a time in my life where I have been “transformed” and will remember this experience for the rest of my life. Then after a few toasts and an opening prayer dinner was served. Our first course was a pesto rice dish followed by a pasta dish with tomato sauce and bacon–both delicious. We took a break course number two to have an end of the semester awards ceremony. There were 6 students presented with academic awards chosen by their professors as having done outstanding work in those subject areas. The next round of awards were probably everyone’s favorites of the night. All the students nominated each other to win a variety of superlatives. We had categories like Best Roommates, Italy’s Next Top Model, Most Likely to Be an SLA, Best Italian Look, Most Likely to Walk into a Fountain While Texting, and Killin’ the #SelfieGame. I’d say we’ve gotten to know each other pretty well in the last 100 days because everyone definitely deserved their awards. Students were also recognized for participating in extra-curricular activities and awards were given out to two students for their involvement in volunteer work throughout the semester. While the 2nd round of awards were being handed out we were served course number three–beef and potatoes. Before too long the administration was giving farewell speeches to the 4 Student Life Assistants who will not be returning next semester and we were enjoying one of my favorite Italian desserts, tiramissu. With a few closing toasts and speeches from the faculty another student closed the evening with a speech about her semester. She too talked about how the JFRC has changed her and made her apart of a whole new and awesome community. We were only here for 100 days, but now Rome feels like home. We were only here for 100 days, but I built friendships that will last a lifetime. We were only here for 100 days, but we have learned more than we could have imagined and transformed in ways we haven’t realized yet. We were only here for 100 days, and these 100 days have been some of my favorite so far. As I’m packing up my room, I’m realizing that I have way too many things. I should have kept in mind that I would be leaving with more than I brought, a consequence of having classes a few blocks off of Michigan Avenue, unfortunately. I found that I had a lot of clothing items that I hadn’t worn almost all year, and that I didn’t want to throw them away. This got me thinking–what could I do with them? Turns out, there are a few options that you can do with your unwanted items. The first and most obvious one to me was seeing if anything I was going to give away was wanted by my friends. I put everything that I was ready to part with in a pile, and let my friends go through it. This got rid of a lot of my things, and I knew that they were going to a good home. Another option is to donate the clothes to good will, or a homeless shelter so people that don’t have more than a few pieces can get them for free or cheap. Good deeds will cost you nothing. If you are looking to make a bit of money off of that $200 coat that you wore once, there is another option. Loyola has a buy and sell page for students, accessible through Facebook. You can always sell your items on there and make a few dollars off of it if you’re lucky. Happy Packing, everyone. Don’t get too discouraged, summer is right around the corner. For all of you organic lovers out there, I found the perfect little place for you! The Heartland Café is a small café off of the Morse stop (just one stop north on the red line from Loyola) that specializes in all-organic and locally grown foods! I have a friend who is a health nut and vegetarian, so we decided to check it out one night for dinner! In this post, I’ll tell you a little bit about this unique place. The outside of this little café matches the rustic feel of the inside. The building is old, probably from the early 1900’s, and is decorated to establish some of the history into the modern business! Upon sitting down, we were handed a unique menu that offered many different types of foods, such as gourmet sandwiches, entrees, salads, and sides—all organic! One of my friends and I decided to try the buttermilk chicken with vegetables and veggie mash (mashed potatoes with vegetables in them!) It was absolutely delicious. My other friend ordered the vegetable gratin, which seemed to be a mixture of vegetables all together on top of potatoes of some sort! I didn’t try any of it, but it looked and smelled delicious! We also ordered pink lemonade, and were pleasantly surprised to find that it was also organic. The lemonade tasted extremely fresh, and was nothing like the bottled sugary pink lemonade we were used to! We also decided to try dessert. We all ordered our own slice of vegan chocolate cake, and it was so amazing! At first I wasn’t sure what to expect of it, because how can you make a cake with no eggs or milk, right? Also, the cake seemed hard until you actually bite into it and find it to be extremely soft! Needless to say, I was skeptical at first but found that I loved the vegan chocolate cake! It’s definitely a must try. Once we were full, we decided to take a look around the shop part of the café. Here, there were many different organic items available for purchase ranging from foods to household items and cleaning supplies. It was really cool to see all of the items that I normally buy regular in vegan form. I know it’s healthier, but sometimes more expensive. However, I’d love to give some of that stuff a try sometime! All in all, if you are ever in the mood for some delicious food, I definitely recommend The Heartland Café. For vegans and non-vegans alike, the food is delicious, the people are kind, and the atmosphere is great! Pop in and order some delicious healthy food sometime! Alright, so I know summer is not here yet. Honestly, it does not feel like summer at all with this recent weather we’ve been having. But as a Chicago native, I shouldn’t be so surprised with the crazy weather. Anyways, in preparation for the summer, I have planned everything out day by day. As I have mentioned before, I will take a summer course over the summer from the last week of June to the beginning week of August. In addition, I plan to continue to volunteer at the hospital on a weekly basis in the patient care unit. To lighten up my summer, my family usually sets aside a weekend in the summer to go up to Wisconsin Dells to have a little fun at the water parks. Personally, this is one the best times my intermediate family comes together and enjoy each other’s company. Also, in the beginning of August, I plan to go on a 3-day retreat in Missouri called Marian Days. I love this retreat and have been attending it since 2011. 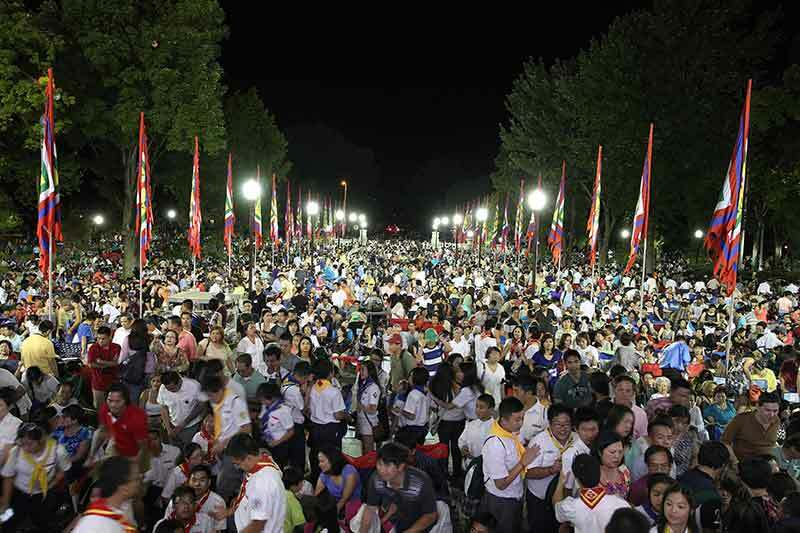 Almost 100,000 Catholic Vietnamese from all around the world come to celebrate their faith and experience their culture on a whole new level. It simply is amazing. 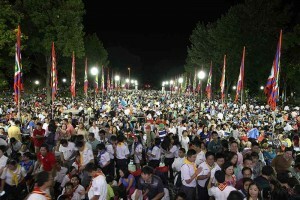 Everyday, there are so many activities people can do and at nighttime, the famous bands and artists play awesome music. This the only place that I know where there are at least 5 people who look exactly like me within a 10 foot radius of wherever I am…..I’m not kidding. I am somewhere in this picture….try to find me.